Learn a new way of gathering data and creating visual and interactive dashboards using the new, free tool – Power BI Desktop. It is independent of Excel and therefore easier to use. Microsoft is enhancing this tool actively. This is the future of analytics and visualization. Start from scratch and then learn the entire lifecycle. Anyone who currently works with data and generates reports will benefit from this course. The course is designed to be jargon free and easy to grasp. No knowledge of Excel or any other programming language or database is necessary. There is a module which introduces you to all the technical concepts you need to know in order to benefit from the course. 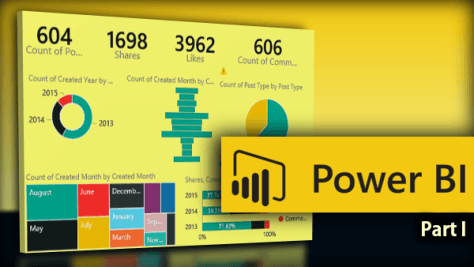 What is Power BI (desktop)? Why not use Excel 2013 or 2016? How to convince your customers or your manager to use new reports? Update: The course is now LIVE on Udemy. Click here for more details. It is currently available at 40% discount with promo code AUTUMN40. Excellent initiative, going to be very useful, promotes productivity. PBI is going to be very popular. I have been working on it since its release. Thanks Sundaresh. Do let me know if you need to add or modify any topics. Dear Nitin Sir, I am one of your blog fan, and have read all of your post till date.They are fantastic !! For a course on Power BI, i fond the content has good coverage and the required depth. Also, since Power BI is evolving as i type, it would be never possible to have the completeness. Its a great initiative. Eager to see progress on this course. Hi Tejas. Glad to know that you find my blog useful. I have already started work on the Power BI course. Will announce it when ready. Do let me know if you want me to cover specific topics which you have in mind. You can also post your queries here. Are you able to announce when the Power Bi course will be available, please? I am about to finish the content creation. The course will be released by 23rd July on Udemy. Is your power Bi course available on YouTube? If so can you please share the link. Hi Hemant. The Power BI course is not available on YouTube. However, in the Power BI course there are many free videos. You can view those and if you like those, purchase the course.